Komatsu Australia has upgraded its Dash 5 “Vantage” grader range’s standard specification and developed “plug and play” kits compatible with leading machine control system suppliers. Komatsu Australia national business manager, government and construction, Phillip Atley said the changes would make its grader offering more attractive to civil contractors. "We have been partnering with Topcon distributor Position Partners and Trimble distributor Sitech to develop 2D and machine control kits that give simple ‘plug and play’ connectivity to our Dash 5 graders," he said. "These kits also allow our graders to be easily upgradeable to full 3D machine control systems, giving machine owners a complete final trim and bulk grading solution." Atley said a major factor in the appeal of Komatsu’s graders is the KOMTRAX remote monitoring system, which gave unmatched asset management capabilities through machine tracking and health monitoring. "KOMTRAX constantly monitors a whole range of machine parameters – including machine location, which makes it an excellent anti-theft system. "Machine data is uploaded to Komatsu’s and to our customers’ machine management systems. This is proving to be a tremendous aid in preventive maintenance, as well as helping managers keep a close eye on how their equipment is being operated," said Atley. Komatsu’s Dash 5 Vantage series of graders consists of two models, the GD555-5 and the GD655-5. Operating weight of the GD555-5 is 18.1 tonnes, with variable power up to 144 kW (depending on which gear is in use), while the GD655-5 has an operating weight of 18.5 tonnes, and variable power ratings of up to 163 kW. Both graders are powered by Komatsu’s Tier 3-compliant SAA6D107E-1 – the same engine used in a number of other Komatsu machines, including WA250PZ-6 to WA380-6 loaders, PC200-8 to PC270-8 excavators and the D51EX-21 dozer. 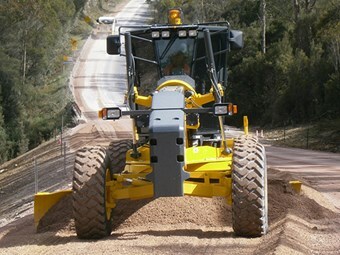 As with previous generations of Komatsu graders, the Dash 5 Vantage series incorporates a dual transmission system, designed to give operators the choice of direct drive (manual) transmission, as used on conventional graders, or torque converter transmission for improved control at low speeds and in final finishing. A powershift transmission provides full power shifting, as well as automatic shifting in higher ranges. 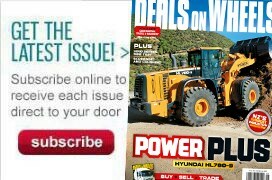 When power for tough grading or low-speed fine control is required, the operator can select the Torque Converter auto (T/C Auto) mode to get more tractive effort and control.